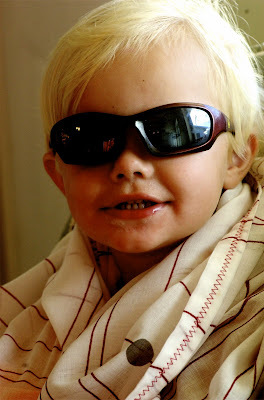 Sunday morning when I came out to get the kids breakfast going I found Cardon (my 2 year old) sitting in his brother's high chair, wrapped up in my table cloth, wearing these killer shades. Hahahahaha! Oh, Cardon. Classic Cardon. oh. my. goodness! I just wonder what he's going to come up with when he's older! That kids kills me he's sooo funny! HAHAH! Man, is he going to be a lady-killer. Cardon, you ROCK!! Nat, thanks for being a camera-mom!! Thank you thank you thank you!!!!! oh. my. goodness!! hahahah that is probably the funniest picture i will ever see in my life!! it is so hilarious. i wish you guys lived closer so that we could all hang out more! !